With the upcoming Battle for Azeroth expansion, we’re overhauling the game’s PvP progression and reward systems. Today, we wanted to take some time to break down those changes and provide some information on what Rated Battleground and Arena participants can look forward to. 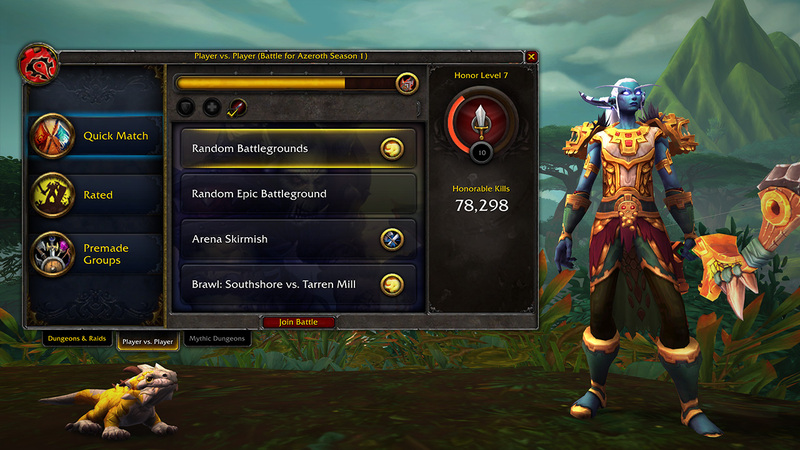 For years, participants in World of Warcraft’s Rated PvP have received numerical Elo-based ratings based on their performance, but what that number means to a player is fairly opaque. Participants currently have to wait until the very end of a PvP season for us to review the full standings and assign titles like Gladiator or Rival based on their relative standing. The specific rewards available in each of these brackets which will be clearly shown in the game’s interface so players can work their way toward earning the items they want most. We’re focusing on two things as we delve into how players earn rewards for taking part in Rated PvP. One focus is refining and clarifying how we reward skill, and the other focus is providing clarity around how we reward participation at varying levels. The feedback we heard around Legion’s PvP rewards pointed toward players’ desire for a more controllable and predictable gearing path. To that end, we’re bringing back Conquest points as a measure of Rated PvP activity; we’re also offering a specific piece of raid-quality gear each week, adding up to full sets of increasing quality over the course of a season. This will make it so players have better visibility into how much time and effort they’ll need to put into earning a specific item and will counterbalance the random nature of rewards elsewhere in the system. With these updates, we want to make sure we’re providing PvP rewards that are commensurate with someone’s level of play. To this end, we’re adding an end-of-the week reward along the lines of the weekly Grand Challenger’s Bounty chests you can earn for doing Mythic Keystone dungeons. These weekly rewards can be collected from a chest in the Dueler’s Guild PvP hub in either Zuldazar (Horde) or Boralus (Alliance). If you’ve filled up your Conquest bar for the week, you’ll receive a reward in the chest of an appropriate item level. The item level of the reward will be based on the highest bracket in which you won at least one game last week. For example, if you played and won at Duelist in 3v3, expect to receive a reward with an appropriate item level for your ranking at the end of the week. However, if you were rated as a Duelist in 3v3, but only participated in 2v2, you wouldn’t receive a Duelist level item unless you had won a game in 3v3. 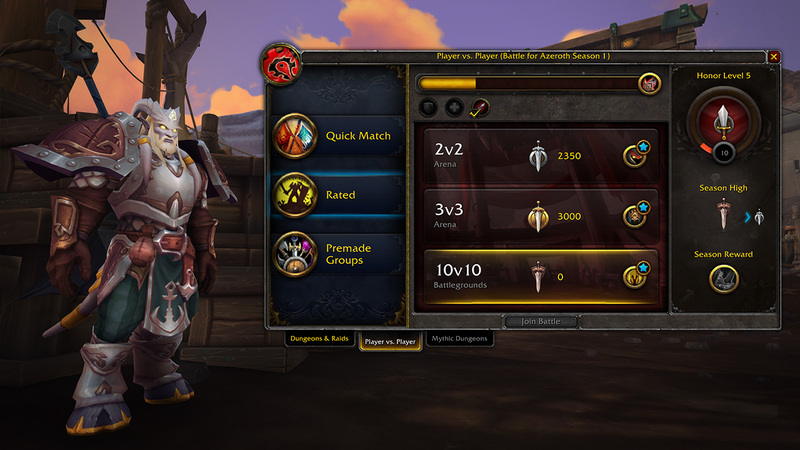 To help provide even more transparency, we’re adding regional tracking so that once you’ve reached Gladiator, you will be able to see where you rank in your region right within the interface. For those aiming to make your way to the very top of the rankings, you’ll be able to keep a close eye on just how far you have to go to get there, or even brag to your friends about just how far you’ve gone. We have more in store for PvP beyond Rated play, so be sure to check back here for more!